I began my last five posts with this: Is Parkinson’s curable? My answer is Yes, Parkinson’s is curable! This is what you need to know in your heart. Today, I want to lighten it up a little and have everybody take a mental break from Parkinson’s. Are you in? Today I want to change things up. Today I want to paint a mental picture different from the gloom and doom mental picture created at the neurologist’s office and all over the internet. Here goes. Are you in? If that had been your diagnosis, how many of you are in? Sit with that feeling for a moment. Aaaaaaaahhhhhhhhhh, suffering from nothing more than an earlier-than-expected natural aging process. Now, while holding on to that outstanding feeling, that hope-and-faith-filled premature aging feeling of glee, let’s step back into present reality. If you are doing the Parkinson’s Recipe for Recovery® then you have nothing to worry about. You are healing your soul and releasing your dopamine by opening your heart, you are calming your mind by engaging in sitting zazen and releasing negative thoughts and fear, and you are healing your body by doing the physical part of the Recipe. You might as well be suffering from nothing more than premature aging. You have nothing more to fear than that, which means you have nothing to fear at all. No fear of life. No fear of Parkinson’s. No fear! Just recovery. As we have discussed many times before, where your heart is focused and where your mind is focused, your body will respond. Faith. Attitude. Action. Progress. Recovery. Cure! Are you in! Thanks Howard…. appreciating your wisdom once again…. and phenomenal support! Every post is a great inspiration, and so a step for Recovery! Faith, Attitude, Action, Progress, Recovery, Cure ! I am in… all the way 🙂 I am grateful to Howard for showing me what needs to be done and sticking with me until it is done. Thanks to all of you for sharing your journey with me. Have a wonder week! With love and gratitude Howard as always, Mr Inspiration! How fun to be told you are looking younger……Have a wonderful day not only looking younger, but feeling younger as you do the recipe! At last a decent Parkinsons website without promoting Big Pharma. Thank you for all the splendid Qigong videos too on Youtube. James, for me, the chanting was one of the hardest, most tiring parts of the recipe but I would urge you to stick with it; it gradually gets easier! Hi James in Blighty, welcome to our community of Warriors! Always great to see new people here. You’ve been guided to your cure. Welcome, welcome, you’re in fine company! Today I did an hour’s Qigong in the back garden: much to the amusement of my neighbour’s children! I’m a relative newbie though; currently into Mingtong Gu (Chi Center, California) he’s young but full of knowledge! Hi, & thanks for the posts; currently struggling with Recipe & visualizing energy flow. doing palm to rib rotations, trunk & neck twists, standing, ling yow chant & meditation/affirmations;-part of me rebels/resists, though. adopting ‘silver lining’ approach = eg. slow is beautiful, take the time, so rare to notice what’s around, time to pray, ‘smell the roses’. You are very brave. Keep up the good work. I am always rewarded when I keep trying….Even if it is just that I know I am doing my best. I agree…it is always good to take time to pray and to smell the roses. 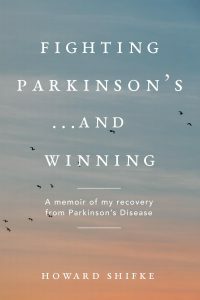 Life is good, Parkinson’s is curable…if you are doing your best and doing the recipe….your best is always good enough. hola a todos y gracias Melanie por compartir tus sentimientos, todos enfrentamos esos fantasmas cuando empeoran los sintomas , la mente basada en adrenalina de inmediato se pone a trabajar generando pensamientos destructivos, justo ayer veia como el temblor de mis manos y en mi cuerpo aumenta, y extremo cansancio y agotamiento tambien y de inmediato el miedo quiere surguir sin emargo digo algunas afirmaciones para desmantelar al ego-miedo, o salgo a caminar. tus comentarios ayudan mucho para entendernos y tener compasion .y en lugar de temer o de odiarse que surga el sentimiento de amarse a uno mismo decirse VAS MUY BIEN MUCHACHO , SIGUE ADELANTE , NO ESTAS SOLO. Hello everyone and thank Melanie for sharing your feelings, all face the ghosts when symptoms worsen, based on adrenaline mind immediately goes to work creating destructive thoughts, just yesterday looked like the shaking of my hands and my body increases, and extreme tiredness and exhaustion and also immediately arise without fear. I say some statements to dismantle the ego-fear, or take a walk. Your feedback helps a lot to understand and have compassion and instead of fearing or hating it exchange the feeling of loving yourself saying GOOD JOB, GO FORWARD, NOT ALONE. I would like to know the opinion of some fellow travelers, while the new spot arrives. Hi Jimmy, I am writing again as you asked for feedback from other warriors. Like you, I applaud Melanie for sharing her vulnerability. I have to say Melanie, in sharing, you lack Fear and demonstrate massive strength. I am always humbled when fellow warriors share their truth. Jimmy we ALL struggle when our symptoms seem to get worse and we feel ” what if I’m one of the ones who never recover?” It takes huge strength and discipline to quiet the mind, and let the heart speak. I get scared at times and wonder have I the strength to endure this journey to the end. I’m staggered at times how I can go from being so positive to so low in a matter of a day. Ofcourse, it is because my symptoms are so challenging. In my heart I truly know as I think we all do, that this condition Is curable, Howard and the others have proved that, we just need to truly believe that each and every one of us will make it. Finding the joy when our bodies are unravelling, for me, is the hardest challenge. I constantly ask God ” let the voice of my soul be louder than the voice of my fear”. As Howard says, symptoms just show us we have more work to do to get to the shiney teapot through the tarnish. I see the shiney teapot already in all of us. I love our courage and our strength and our perseverance, our vulnerability and our Hope. We truly ROCK and shake lol. Please God ” this too shall pass”. When our symptoms are at their absolute worse, whose to know, the darkest hour is just before the dawn! Love you all. por la oportunidad de sentir este precioso cuerpo y esta maravillosa mente. the opportunity to experience this beautiful body and this wonderful mind. your warm and radiant light.